This may have been the quirkiest film I’ve seen in quite a while. It wasn’t exactly as advertised, but it paid off in the end. Gunther is the world’s greatest assassin, so to make a name for themselves, a group of assassins sets out to assassinate him, but their plans turn into a series of bungled encounters as Gunther seems to always be one step ahead. The story is told as a mockumentary, which wasn’t exactly what I expected, but the format helped to cleverly mask the low budget of the film. 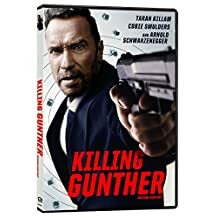 Killing Gunther was funny enough, and there was enough light action to carry the story but it didn’t really get going until Gunther (Schwarzenegger) made his eventual appearance. This is the value a true star can bring to your film. He wasn’t wasted, and his performance did elevate that of the entire cast, but it took a bit too long to get to him. I liked Schwarzenegger in this one because it seemed like he was there to have fun, and just make a fun little film…with assassinations. Unfortunately the shooting style can turn off some, and the fact that Arnold isn’t seen until the last third of the movie makes the wait a little tedious at times. Bottom Line: As long as you don’t go into this thinking it’s a Schwarzenegger film, you should be okay. Don’t have super high expectations and you can enjoy a quirky little bit of cinema. Posted on 18-07-05, in 3 Star, Comic Book Movies, Movie Reviews and tagged Amitai Marmorstein, Arnold Schwarzenegger, Bobby Moynihan, Cobie Smulders, Hannah Simone, Mockumentary, Taran Killam. Bookmark the permalink. Leave a comment.